Wow! 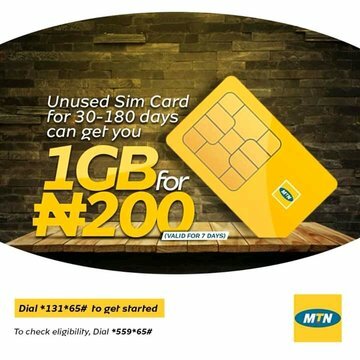 What a great news for new MTN users that haven't used thier sim up to 1-3months. Right now, you won't believe MTN has totally launched some amazing and great data offer for them to enjoy at low cost of among which is valid for 7days and 30days as well. This new offer is for new customers and it also works for those who haven't use their sim on Mobile or Smartphone for over 60-90days. This offer gives them Awoof 1GB data for just #200 valid for 7days and of course, they will also have access to subscribe And enjoy Amazing 4GB data Valid for 1month cost #1000 only. Apart from the amazing Awufu data, It's clearly confirmed that new or subscribers that haven't used thier sim up to 90days will also enjoy benefits of Awufu bonus for SMS and Call on any recharge during the day Valid for 14days. Therefore, To know whether you're eligible for this offer quickly dial 👉*131*65# to purchase the plan.